60's FOLK REVIVAL: 60’s Folk Revival In Hamilton! 60’s Folk Revival In Hamilton! 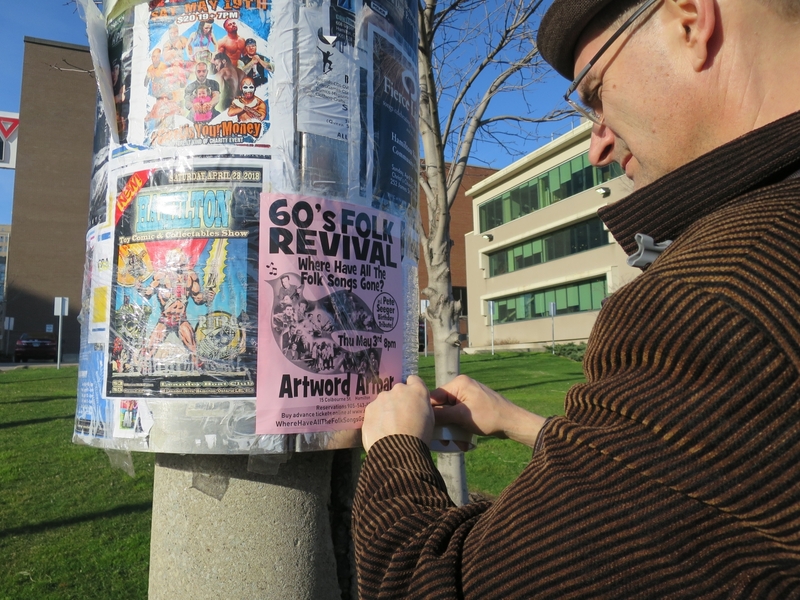 We zipped over to Hamilton last week to do a little postering in advance of our May 3rd 60's Folk Revival show at the Artword Artbar. As we were putting them up they were generating interest from passersby. We're hoping that translates into a nice full room of singalongers! Yes...the audience gets to sing along. We even hand out songsheets! May 3rd also happens to be Pete Seeger's birthday...would have been his 99th....so there will be an extra emphasis on celebrating this great man and his music. If you haven't been to the Artword Artbar yet, I'm sure you will be thrilled as we were to find this cosy, welcoming space run by Ronald Weihs and Judith Sandiford who are dedicated to presenting quality theatre and music. ~ Licensed. Micro-brew on tap. Wines, highball cocktails, bottled beer, coolers. Also espresso, tea, juices, and light meals. ~ Accessibility: the main floor is half a story above street level. Washrooms are a full flight of stairs down to the lower level. Hope to see you there. It is going to be a fun show.